Hello from Van’s Natural Foods! As you may know, February is American Heart Month – a great time to think about our heart health and how we can make changes to lower our risk for heart disease. Heart disease is a serious concern for both women and men and is the leading cause of death for all Americans. At Van’s Natural Foods, we take our customers’ health concerns seriously, offering a robust line of allergy-friendly foods, delicious whole-grain snacks (including brand-new multigrain chips!) and wide variety of whole grain breakfast options the whole family can enjoy This month, we’re launching our newest waffle, the fiber and whole grain-rich Love Your Heart Waffle. Made from a mix of hearty whole grains including whole wheat, barley, oats and more, Van's Love Your Heart Waffles are packed with 34 grams of whole grains and 7 grams of fiber per serving, and help lower cholesterol. With this launch, Van’s becomes the first brand in the frozen-foods aisle to offer a waffle that addresses a targeted health concern. 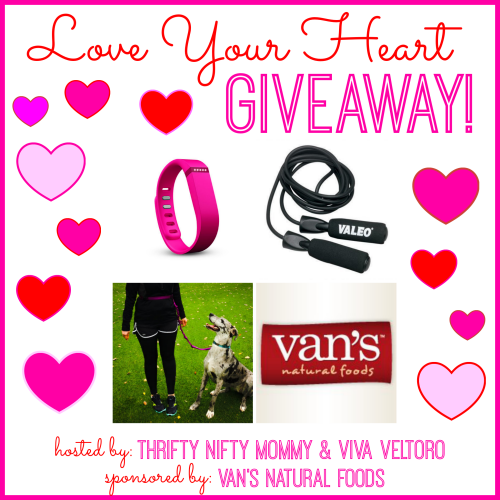 To celebrate our new Love Your Heart Waffle and raise awareness about heart health, Van’s is offering a giveaway this month which includes a Fitbit Flex™ wireless, a Valeo Fitness Cardiovascular Deluxe Speed Jump Rope, a hands free running leash and Van’s free product coupons – hopefully a helpful inspiration as you work to keep your own heart healthy. This prize package is valued at $150! Just enter using the Giveaway Tools form below. We also encourage you to visit the Heart Truth Pinterest page, which is a rich resource of heart-healthy recipes, exercise tips, survivor stories and additional ideas for living a healthy lifestyle. *3 grams of soluble fiber daily from whole grain oat and barley foods, like Van's Love Your Heart waffles, in a diet low in saturated fat and cholesterol, may reduce the risk of heart disease. These waffles provide 1 gram per serving. We wish you a very Heart-Healthy 2014 and beyond! This giveaway is open to the US only, ages 18 and up and ends 2/26/14 at 11:59 PM EST. Disclosure: This contest has been organized by Thrifty Nifty Mommy and Viva Veltoro. I have not received any compensation for hosting this giveaway. The participating bloggers are not responsible for prize fulfillment. Please contact thriftyniftymommy (at)yahoo.com or vivaveltoro(at)gmail.com with questions. I have been really worried about my heart im in my 40's so its not time in my life to not be concerned. The things i have been doing is keep active and i cut out the sweets and most of all i cook smarter and eat healthier.. I plan on taking a nice walk everyday for about 30mins. I've started eating better, walking with my dog but not enough! I'm working on walking with her more n doing some more exercises.